The process of drywall installation involves numerous preparations and following to correct stages, so for excellent results and easier process of work let real professionals take care of your walls. It is very important to plan and design everything scrupulously before the installation of drywall starts. 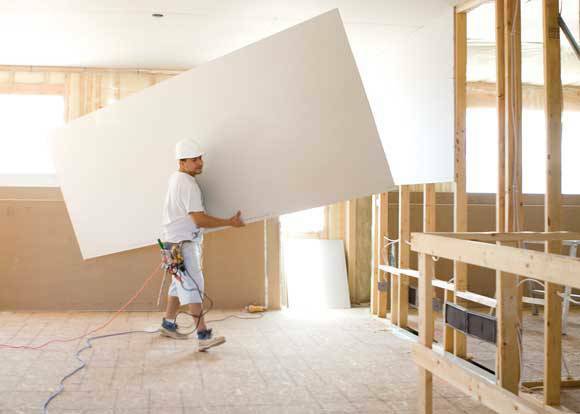 Drywall panels are a very fragile material, therefore successful installation depends on a wide range of factors from the very beginning: safety precautions, correct choice of tools and proper type of drywall, temperature of surrounding. Our experts at House Renovations consider all details and are ready to face any challenges to accomplish your project installing wall, ceiling or bathroom drywall. Due to the difference in temperatures and high level of humidity, the process of installation of drywall in a basement or bathroom turns out to be more difficult task than in any other room of your house. Installing basement or bathroom drywall professionals at House Renovations company have sufficient knowledge and experience necessary for correct choice of work materials and tools required for Toronto’s weather conditions and perfect installation of proper drywall in any room of your home. Have you noticed any scuffs and holes or other kind of damage on the drywall? Have you thought of its urgent replacement or changing furring strips on ceiling for drywall? Nowadays you do not need to waste money and time on a such hard and intensive job, just let the crew of real experts of House Renovations company perform maintenance and repair works of your wall or ceiling drywall. Save your money for other important projects. Was your house built before the 1980s? Do you have popcorn ceilings that can contain asbestos? Have you got leaking or damaged ceiling that can be a reason of lung cancer? It is a high time to have ceiling drywall made. We offer the best possible services and methods for installation and repair of ceilings using furring strips to provide a structural base to hold ceiling materials. The main hostile element that shortens lifespan of drywall is water or, to be more specific, high level of humidity. Here, at House Renovations company we offer only reliable waterproof and long lasting drywall for your walls and ceiling. Give us a call or forward us an email and we will take care of your project. Our specialists will accomplish it for competitive pricing and provide best-quality work plus offer free consultation services across Toronto and GTA area.